Sheltered by oak-clad mountains in Southern Spain stands a 15th century, white-washed Andalusian farmhouse, within a unique private estate surrounded by a magnificent, protected landscape, writes Andrew Forbes. This is La Donaira, an upscale destination for nature-lovers, horse-riders; and travellers seeking authentic and sophisticated cultural, food, and wine experiences. Yet this is so much more than an exclusive, 9-room private country estate. In my experience, it goes well beyond a luxury experiential retreat. 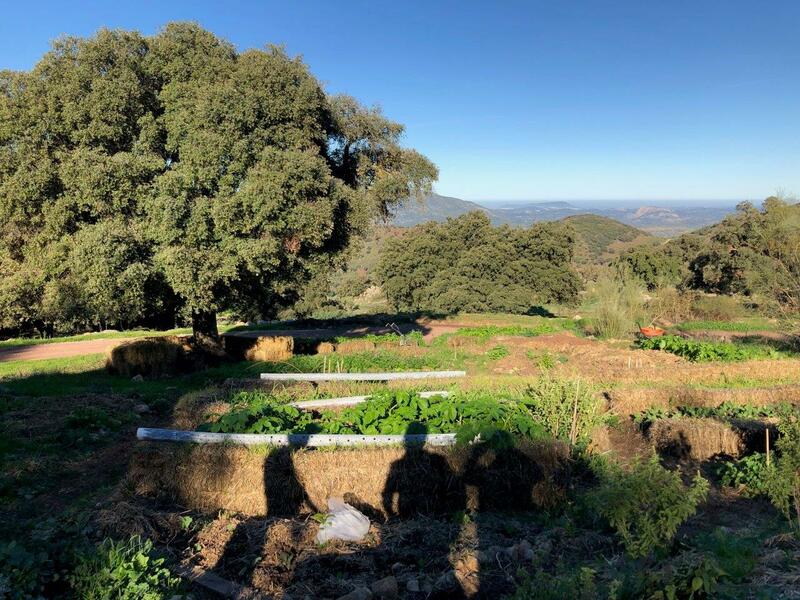 It is also an ambitious holistic, permaculture project aimed at creating a sustainable community that is helping to restore organic farming and natural horsemanship to the local area. 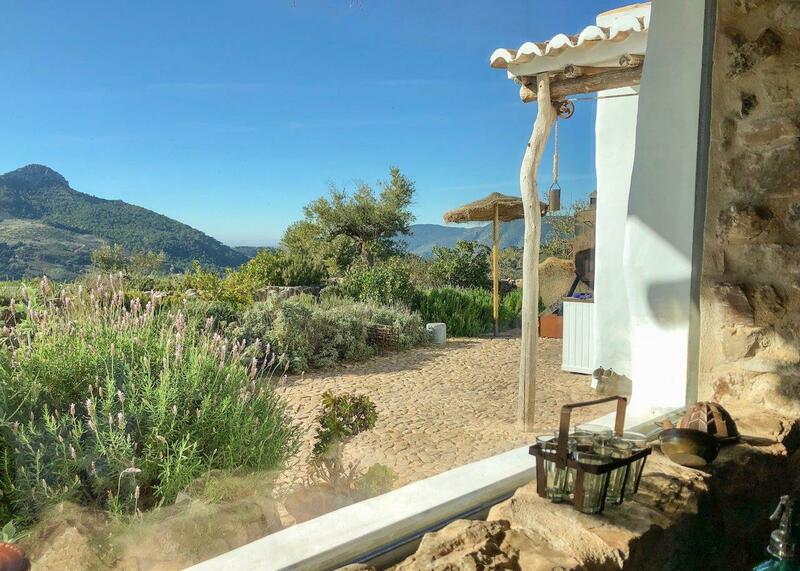 This Spanish finca is within the Serranía de Ronda, a spectacular, mountainous region that takes it name from one of Andalucía’s most iconic and picturesque towns – Ronda. 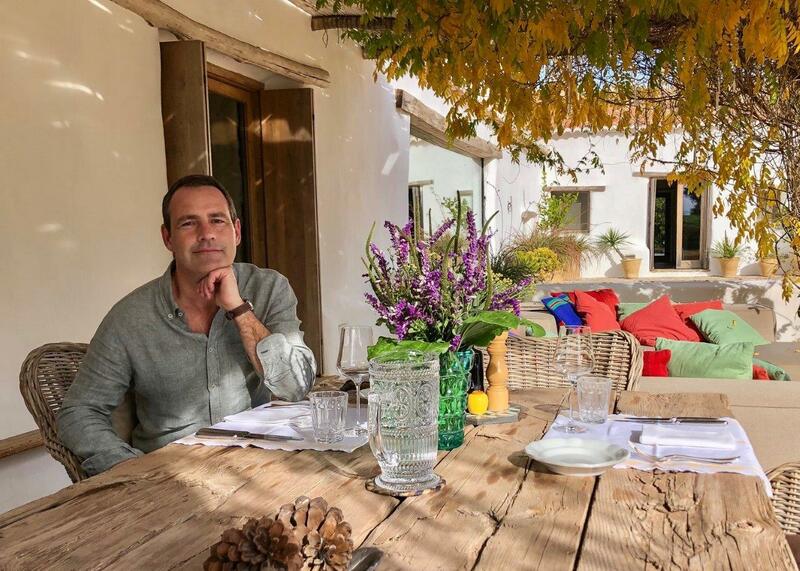 This part of Andalucia has in recent years emerged as a European hub for not only luxury rural tourism, but also world-class projects in agricultural sustainability. 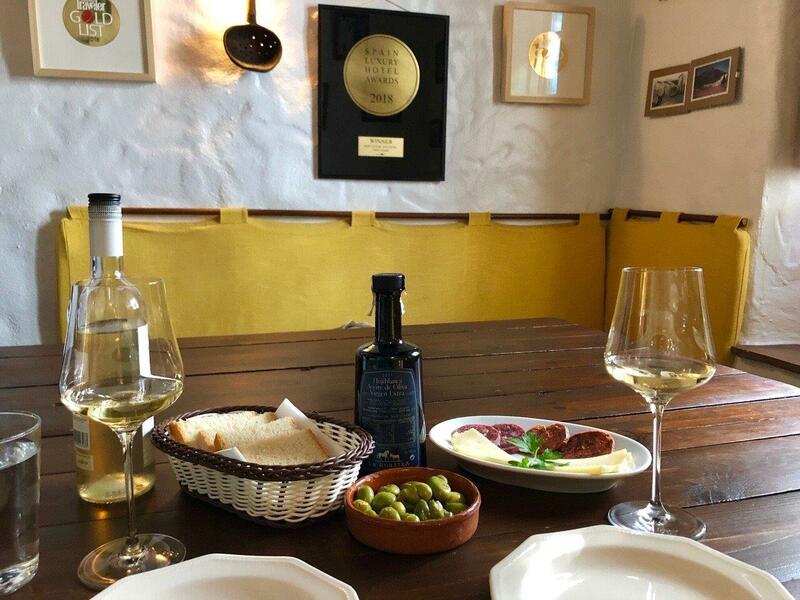 Ronda has a cluster of upscale, award-winning, boutique wineries where once lost, centuries-old European vines are being restored and fine wines made. 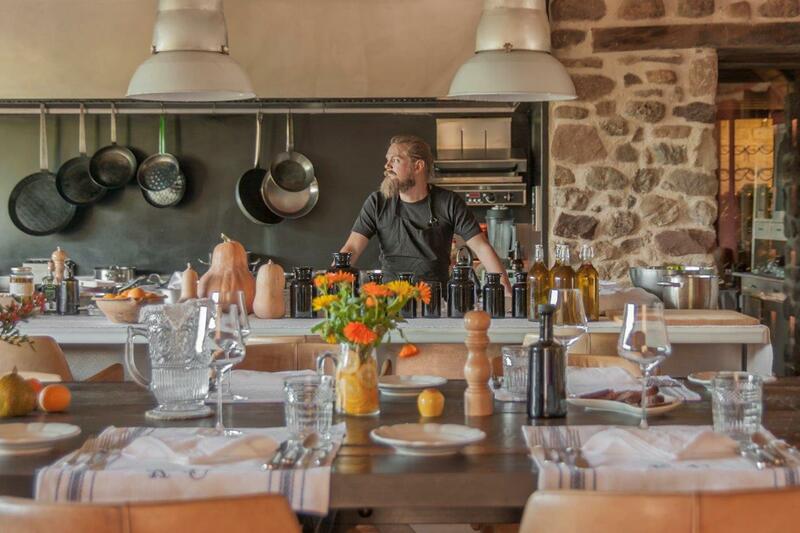 Olive oil estates harvest the area’s ancient groves, creating liquid gold that is used in Michelin-star kitchens and served at the tables of some of the world’s finest restaurants. 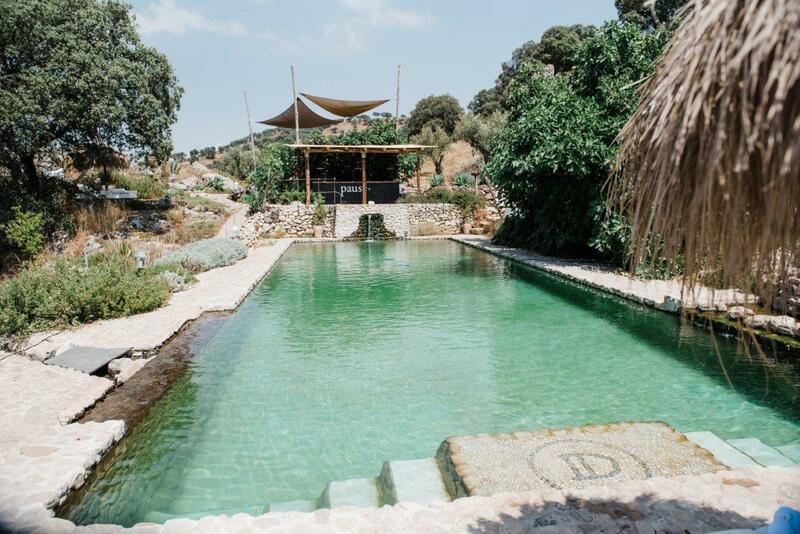 La Donaira has been an integral part of this movement in Southern Spain; showcasing both the art of exclusive rural slow travel; as well as the possibilities for making a significant, positive contribution to the local community. 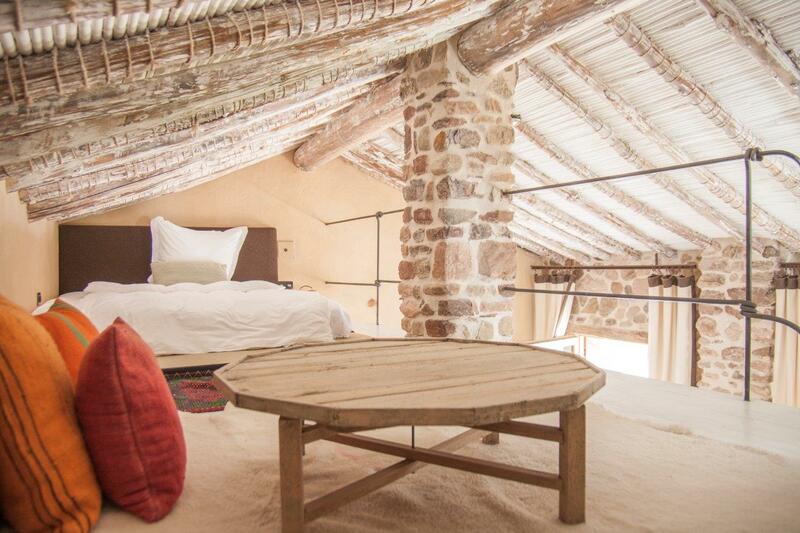 The traditional farmhouse has been completely renovated and is now a fabulous retreat with 7 seductive guest rooms and suites; and two creatively furnished, upscale 50sqm yurts, perfect for modern nomads that want to be truly amongst nature. There is discreet spa with 21m heated indoor pool, found in an understated structure, built from rough stones collected from the estate. 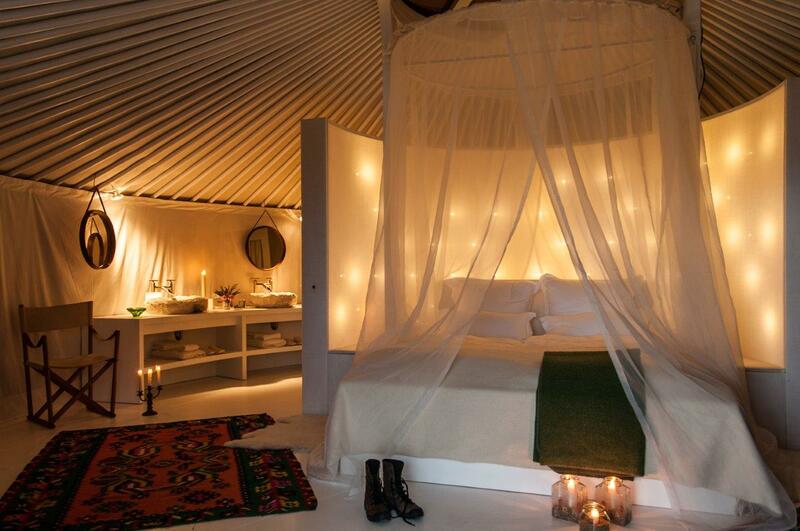 Once inside, it is a luxury sanctuary where tranquillity, warmth and peace embrace you. 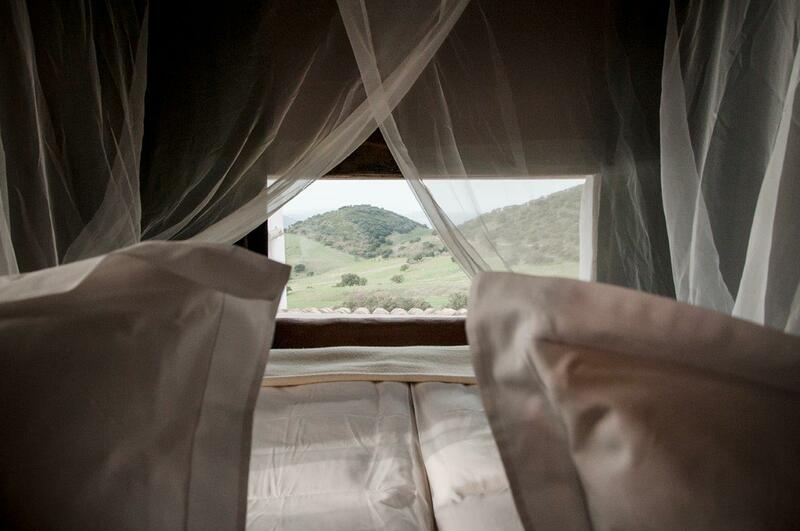 Nature is never far away – panoramic windows bring the outside in. 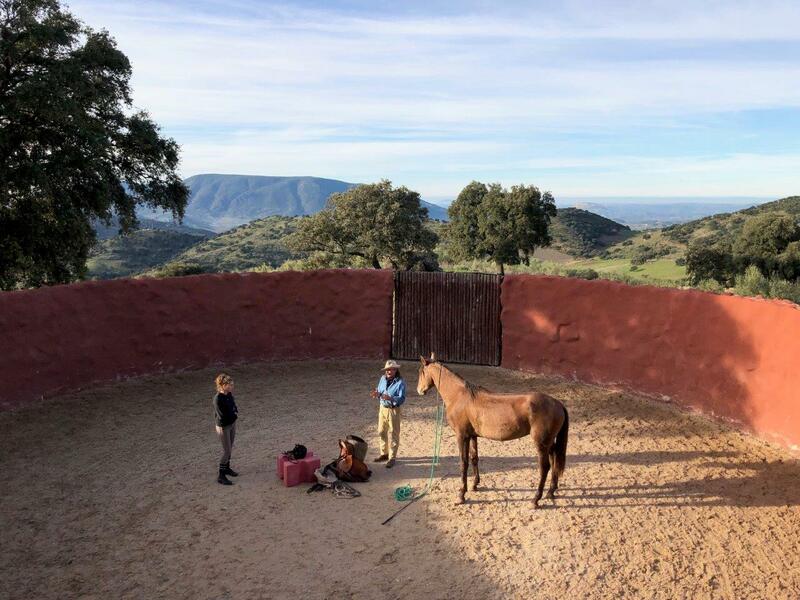 Before emerging as a luxury vacation retreat, La Donaira already had a loyal following thanks to its world-class equestrian centre where natural horsemanship is being brought back into focus and shared with a new generation of equine enthusiasts. The luxury country house is surrounded by expansive countryside, and beyond by stunning mountains ranges, a scale that is rarely seen elsewhere in Europe. La Donaira’s organic farm, which is striving to make the retreat as sustainable as possible, covers some 17,000 acres (almost 7,000 hectares). 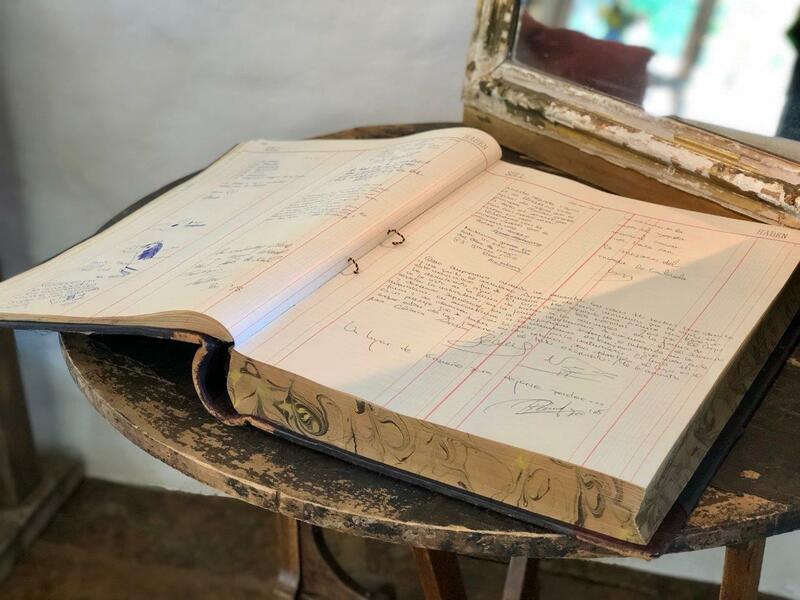 It encompasses rare breeds of cattle, together with goats, sheep, hens and, as part of the development of natural farming, bee hives set amongst the ancient oaks. The working farm and adjacent medicinal fruit, vegetable and herb gardens supply La Donaira’s kitchen – providing guests a genuine field-to-fork experience, and one that they can be involved in, from sharing time with the many estate volunteers, learning about the concept of permaculture; to taking part in hands-on food and wine workshops. If you are anything like me, then at first it will be the über-chic country house that will seduce you. 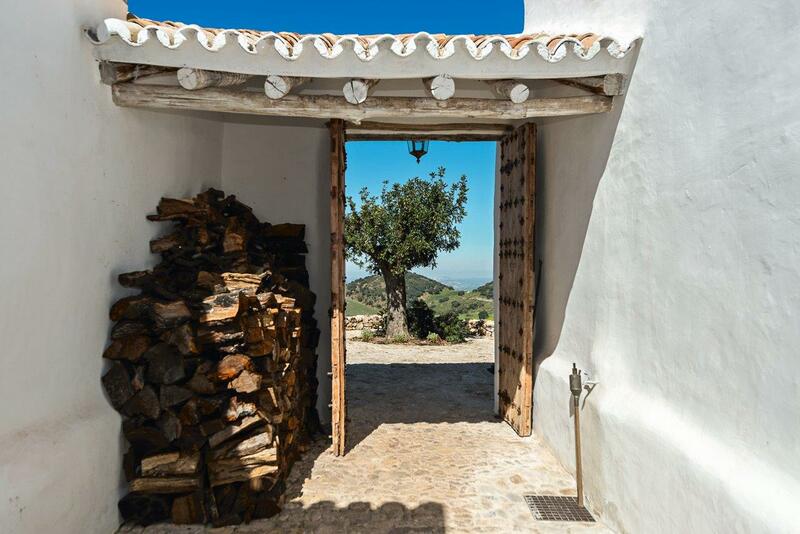 La Donaira has a very special interpretation of rural Andalusia chic – one where the traditions of the past are perfectly married with the comforts of today. Yet by the end of your stay I am sure it will be the values and goals of this estate that will be your lasting memory. 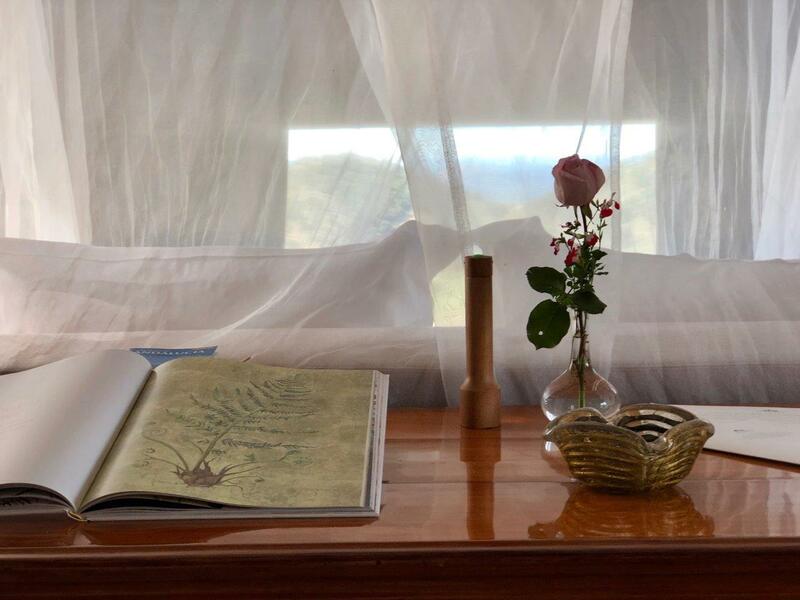 La Donaira is remarkable in how it allows guests to feel connected to nature; how it embraces you with peace; and how the staff, as well as the team of volunteers, inspire you with their commitment to bothhospitality; and a healthy, sustainable way of life. 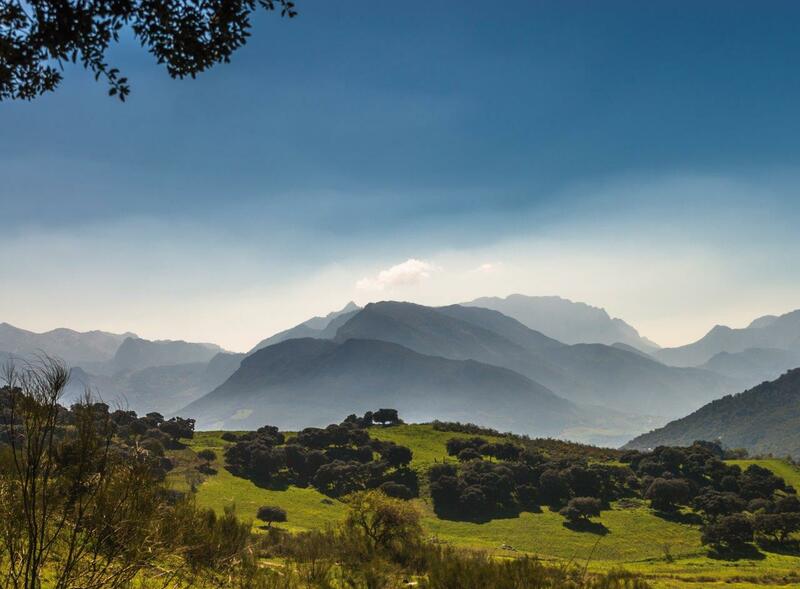 La Donaira is in the heart of Andalucía’s natural beauty, within the triangle of the National Park of Sierra de las Nieves; the Natural Park of Grazalema; and the Alcornocales Natural Park. It is a unique environment – rich in plant and animal diversity. The historic postcard-perfect town of Ronda is half an hours’ drive away. Guests can be collected by private transfer from the airports of Seville, Jerez or Malaga (from 60-90 minutes away). Alternatively, if you are travelling by car you will be met in the nearby village of Gastor. Southern Spain’s most iconic cities can all be enjoyed for a day-trip; from the monumental magnificence of Cordoba; the capital attractions of Sevilla; Granada with the world-famous Alhambra; and of course, the seaside city of Malaga with its world-class cultural attractions such as the Pompidou, and Picasso Museums. As you might imagine from what I have already shared about La Donaira, arrival and check-in here is far from the ordinary. This is not a hotel. It is a private estate in the foothills of the sierra, reached by single lane country track passing century-old oaks and rolling pastures. 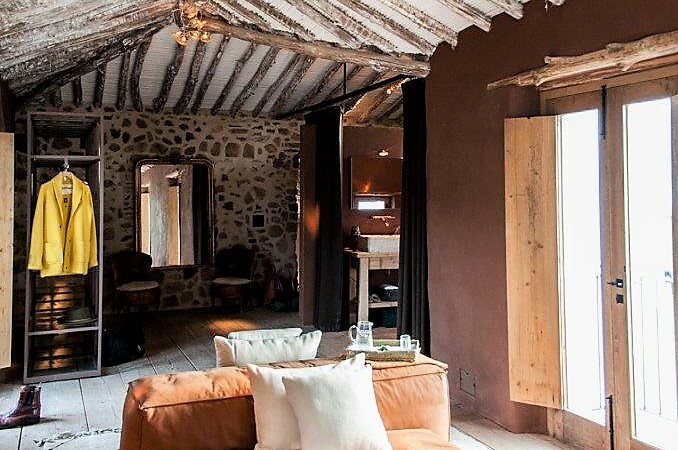 So guests are met in the local village, El Gastor, a delightful place of white-washed houses covered with terracotta clay tiles. Here one is welcomed at the local Posada, or inn, where La Donaira’s reception and guest relation team have offices. 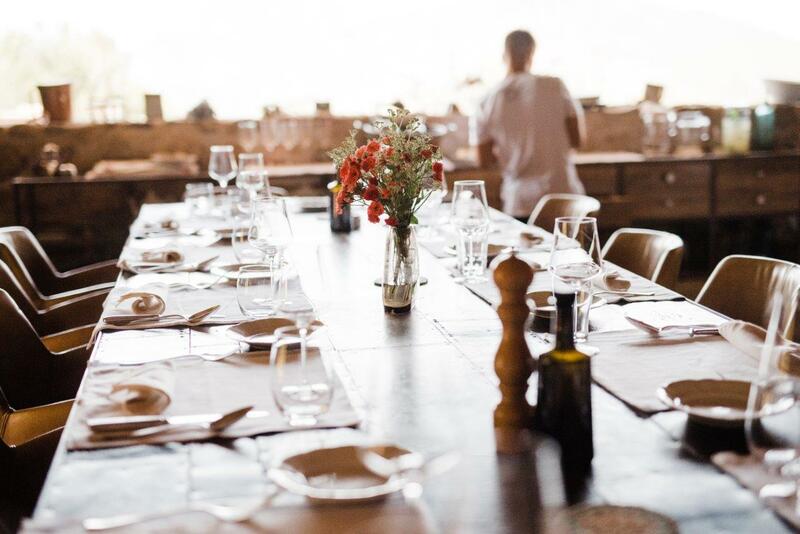 Expect a table to be set for you with local wine, cheeses and cured meats. Your experience starts right here. 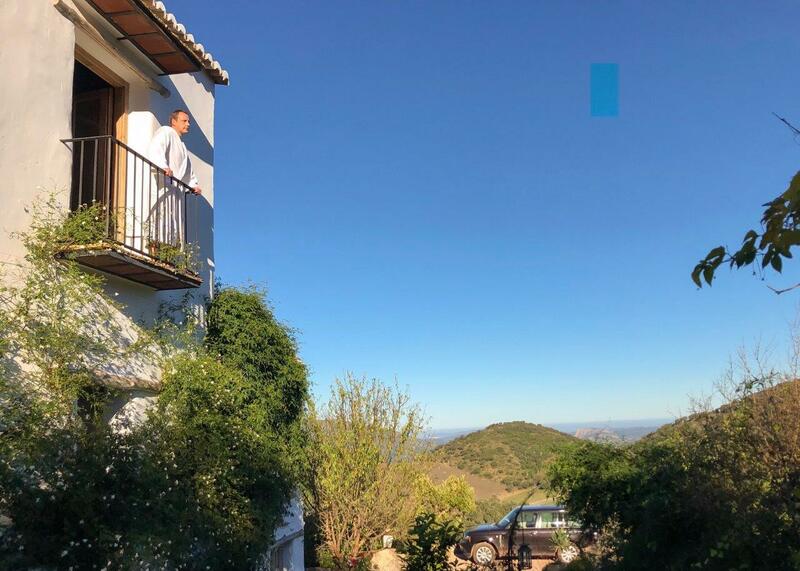 Whilst your car is being valet-parked, and the check-in formalities are swiftly completed, you can sip a local Ronda wine and begin to unwind. Shortly, one of the estate’s drivers arrived to collect us. Before long we found ourselves aboard the robust 4×4 and leaving the narrow streets of the village behind. We slowly climbed the winding road to La Donaira, through olive groves and farmland. 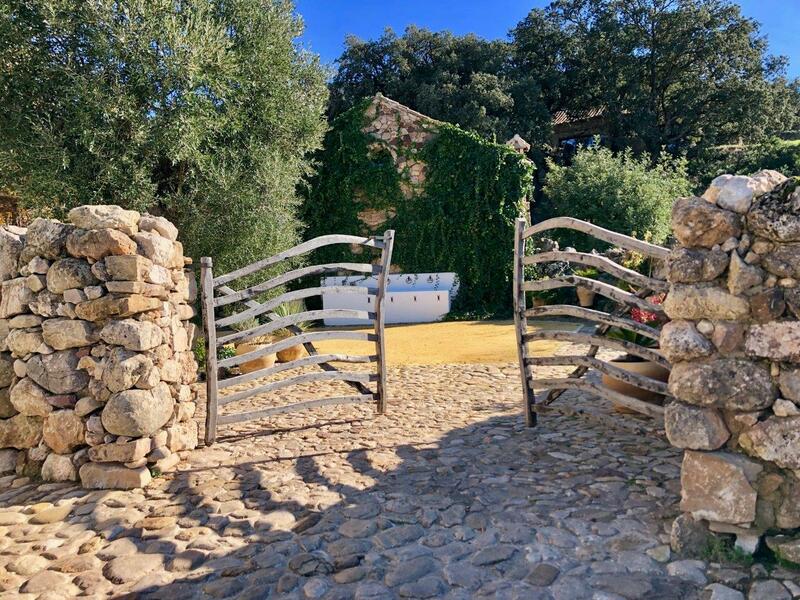 Only members of the La Donaira fleet can access the property – so one feels an immediate sense of exclusivity as one passes the electric gates and enter the private estate. As the car draws up onto the stone-cobbled drive way, Virginie, La Donaira’s GM was waiting to greet us. 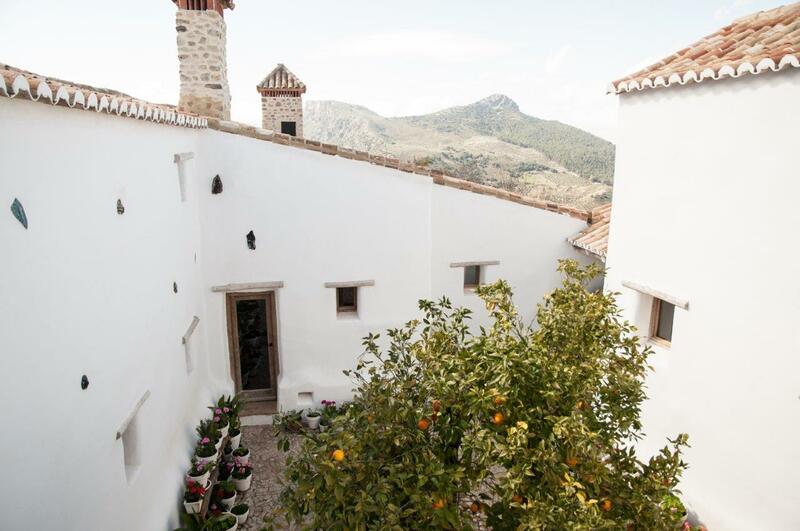 La Donaira retains the authenticity of a Spanish cortijo yet has been restored to reflect the expectations of high net worth travellers. A mix of notable antiques, rustic pieces and bespoke furniture combine to create a tasteful, eclectic and sophisticated style. Original art, coffee-table books, collectables from the different corners of the world, and shelves of vintage vinyl records makes the house feel like a home. The guest rooms are individually decorated – each space unique thanks to the higgledy-piggledy nature of the house. 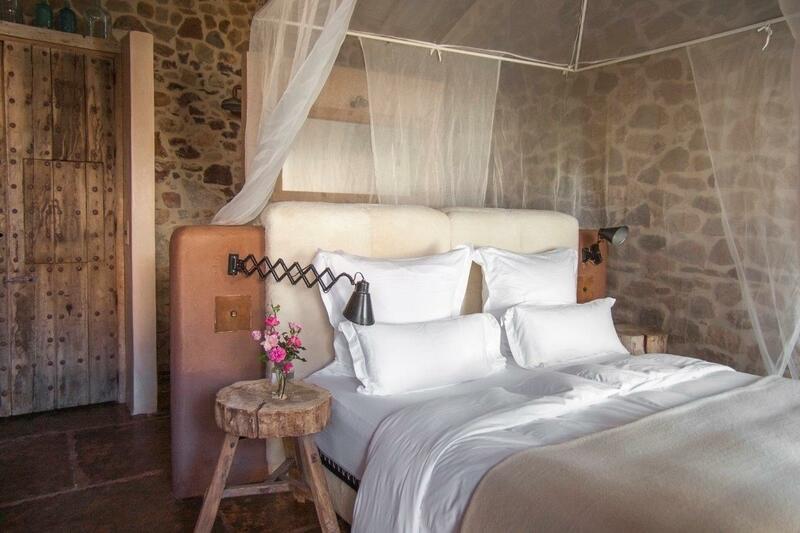 Expect fabulous beds, bespoke bathrooms fixtures, curated furniture and interesting art. The long, gallery style room was full of luxurious details. The main pieces of furniture defined each space. 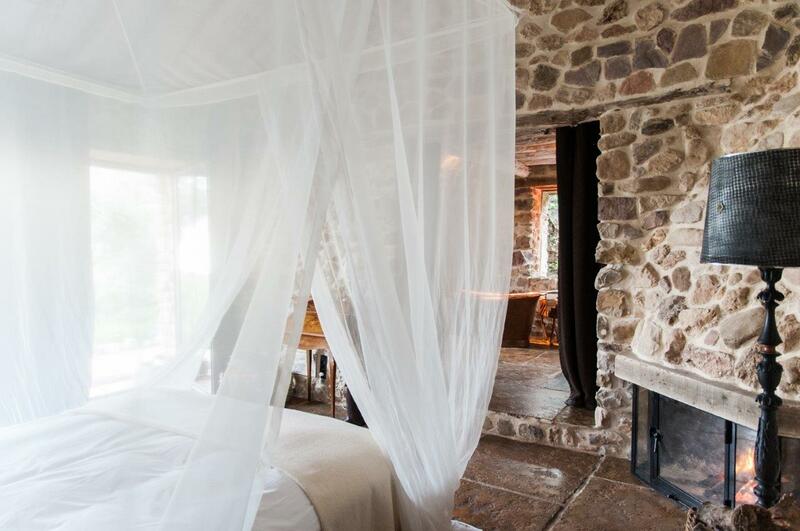 At the front, facing the large window with views to the mountains, was the bed elegantly covered with a brilliant white mosquito net. Then there was the designer leather sofa, a cosy place to relax. 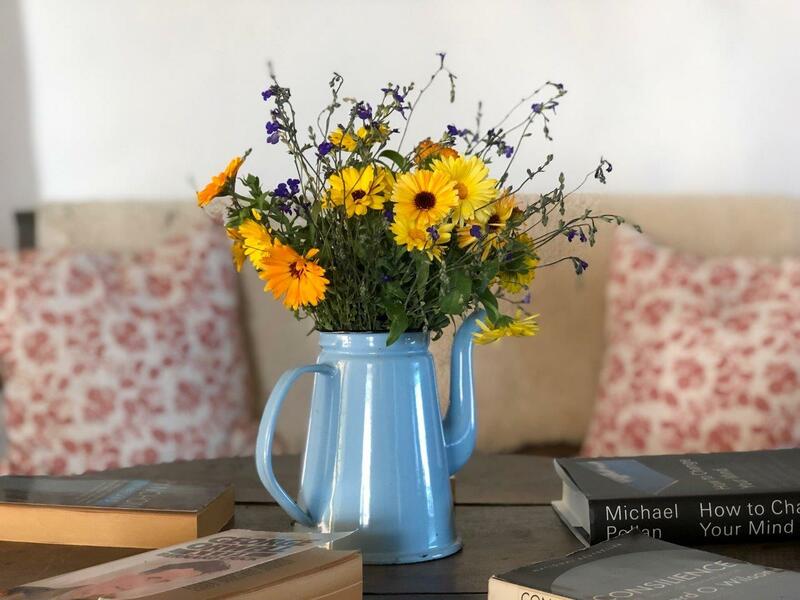 The dressing area had open, contemporary glass-shelved wardrobes, with details including vintage wooden garment hangers; a fine wool poncho for walks in the countryside; crocks for wondering around the house; and organic thick cotton slippers for the room. 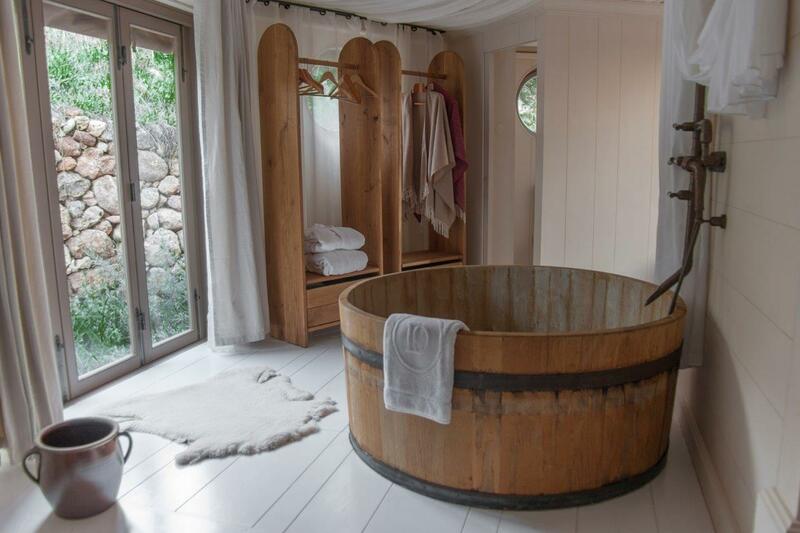 The large bathroom, divided by heavy woollen curtains featured bespoke wash-hand basins hewn from stone from the neighbouring Grazalema Natural Park, and a large cooper bath. Twin showers with vintage style fittings completed the look. 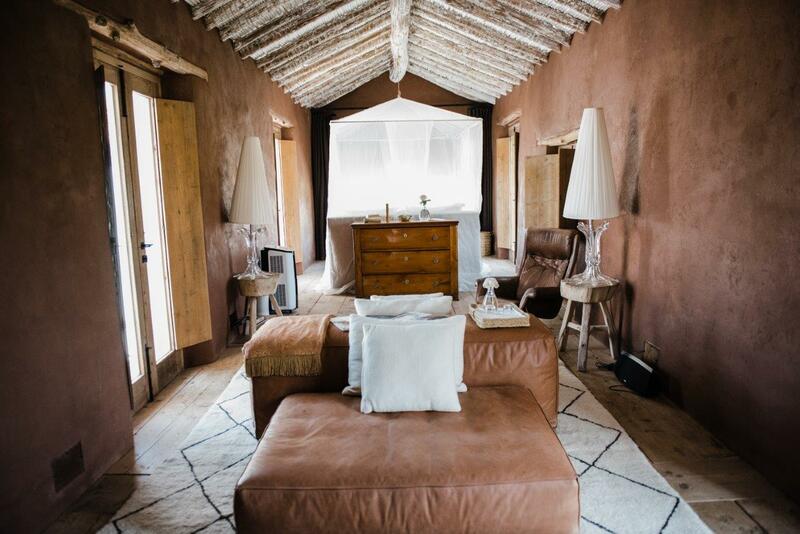 This has to be one of my other favourite guest suites at La Donaira. I took a peek and just loved it. 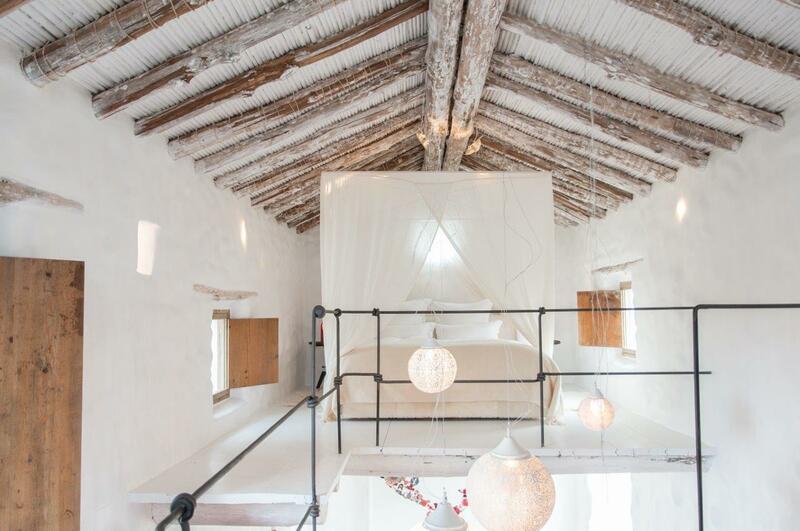 This duplex has a ‘Ibiza-meets-Andalucia’ vibe; brilliant white walls, whitewashed woodwork, and a summery net-draped bed. …to the expansive, duplex Room Sophia. Other rooms are in an adjacent, stone-built wing with floor-to-ceiling garden view windows that let the Andalusian light flood. Here you can find Room Magnolia for example. 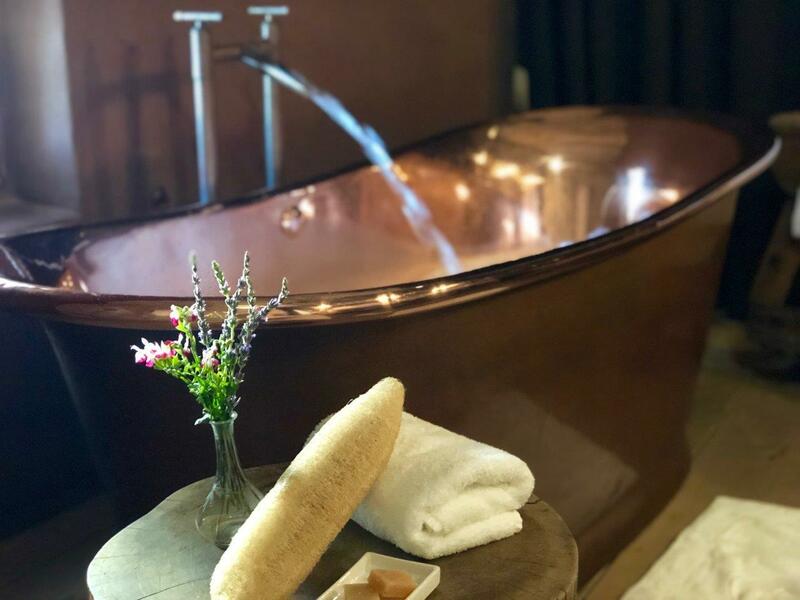 In addition to 7 guest rooms and suites in the main house there are two luxury yurts for those guests that want to take glamping to the next level. I soon discovered that the kitchen is the heart of La Donaira. 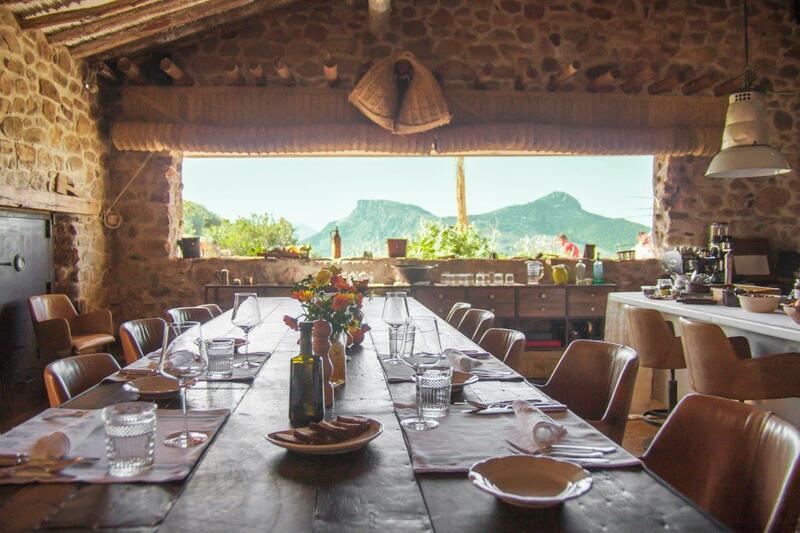 This cavernous space, with high ceilings and its distinctive panoramic, almost cinematic window looking out to the Grazalema mountain range, is where guests share meals. The doors are usually open, the space flows onto the covered terrace of the south facing courtyard. Bespoke artisan fixtures and vintage collectables make the kitchen dining room homey and welcoming. 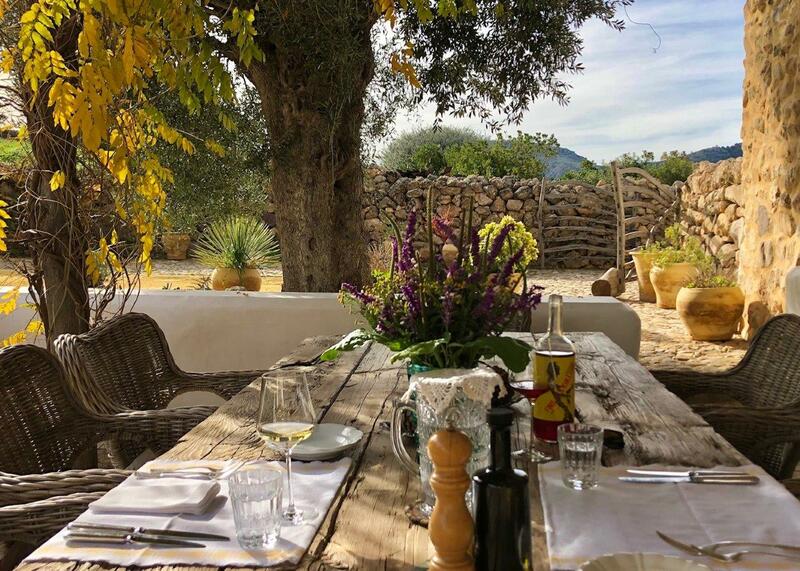 Food and wine are very much at the centre of the La Donaira experience. The farming techniques on the estate encompass natural bee-keeping, organic vegetables and crops, and raising rare breed cattle. Much of the cuisine is vegetarian. Fabienne was our friendly and talented chef who prepared three course lunches from the estate produce. This is genuine ‘zero-kilometre’ cuisine. 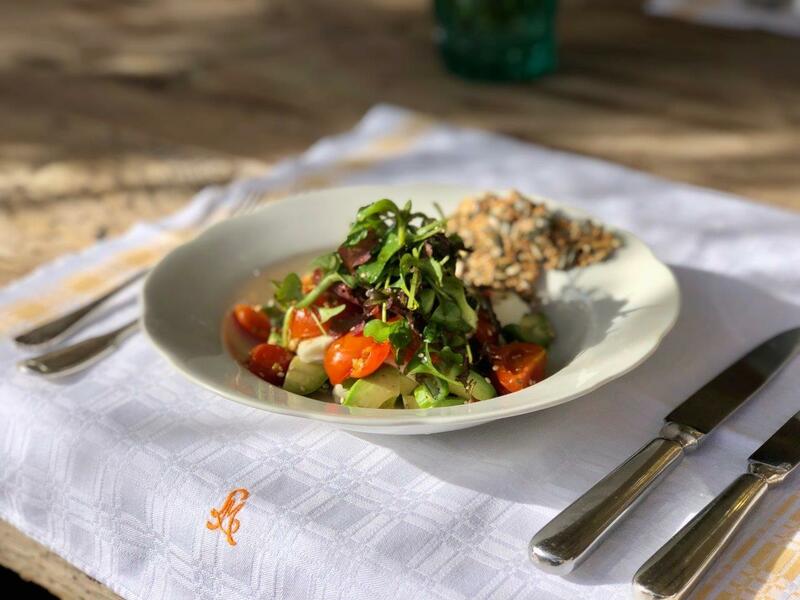 Lunch included a flavoursome salad of home-grown greens and micro greens, local avocado, homegrown tomatoes and Spanish mozzarella, served with homemade seed crackers. 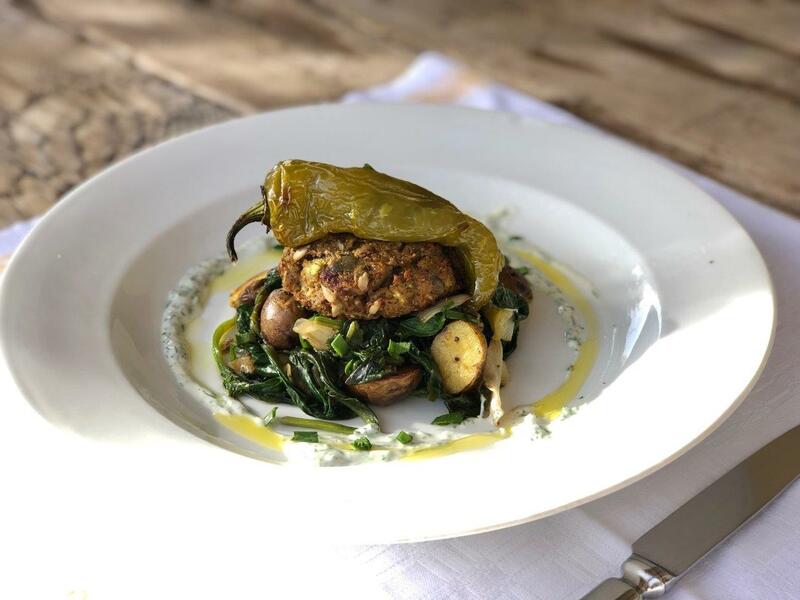 The main course was a vegetarian patty with spinach and peppers – simple homespun food that was sophisticated in its flavours and textures. Another day the lunch was homemade pasta with garden sage; and a pudding of quince with fresh yoghurt. 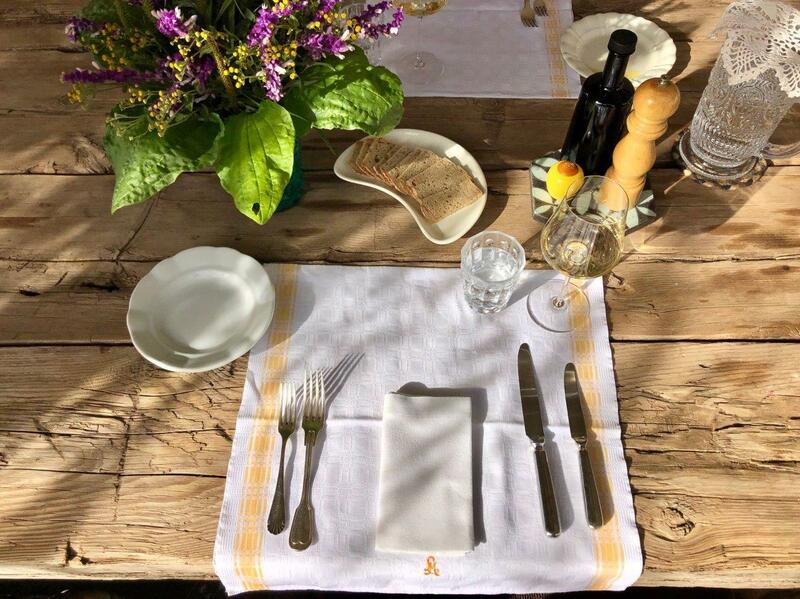 Dinner can be a more elaborate affair or guests can be driven into the village for supper at a local inn. 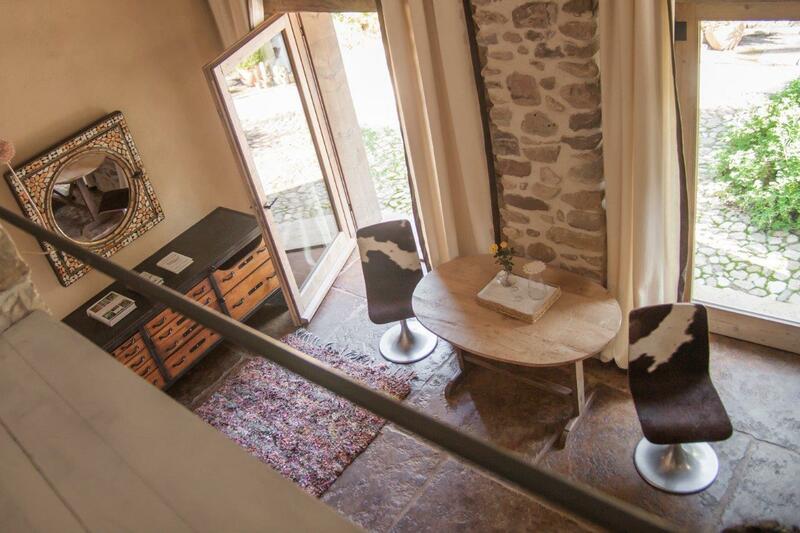 La Dionaira also offers private wine tastings of organic and natural wines from the estate’s superb cellar. 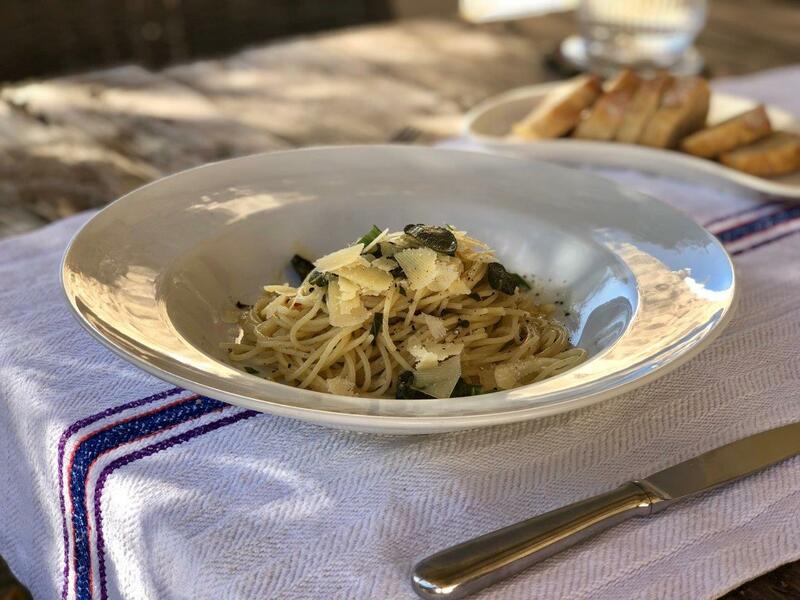 In addition, the chefs can offer workshops so enthusiasts can learn more about how to prepare the local produce and the diverse ingredients from the medicinal herbal garden. 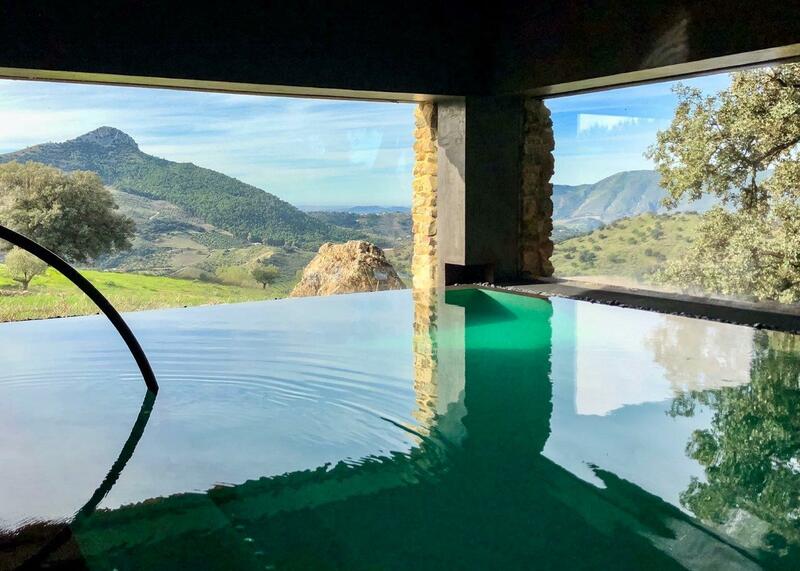 Before arriving, I reviewed the compelling list of potential experiences, from the natural horsemanship of the equestrian centre; the wellness treatments at the onsite spa; to the Andalusian food and wine workshops. Yet once I had arrived and settled it, I realised that La Donaira was the experience. 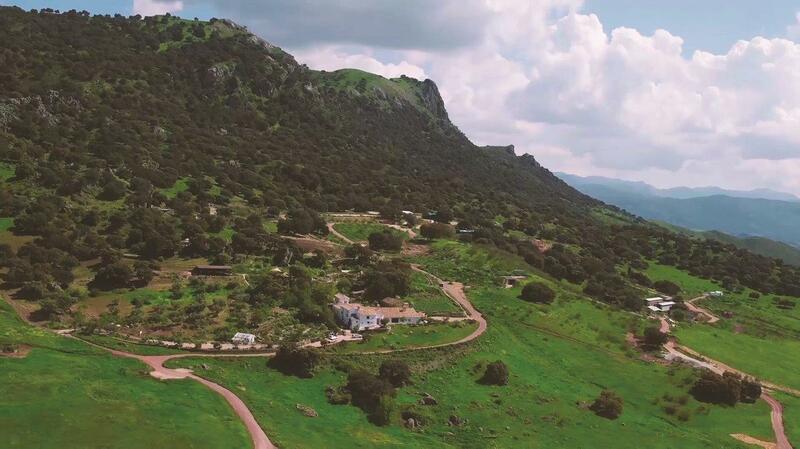 It is hard to convey, but although the guest relations team can create any number of tailored experiences from paragliding to horse-riding, for me, it was exploring La Donaira that was remarkable. You only have to read the guest comments to know how special a stay here can be. 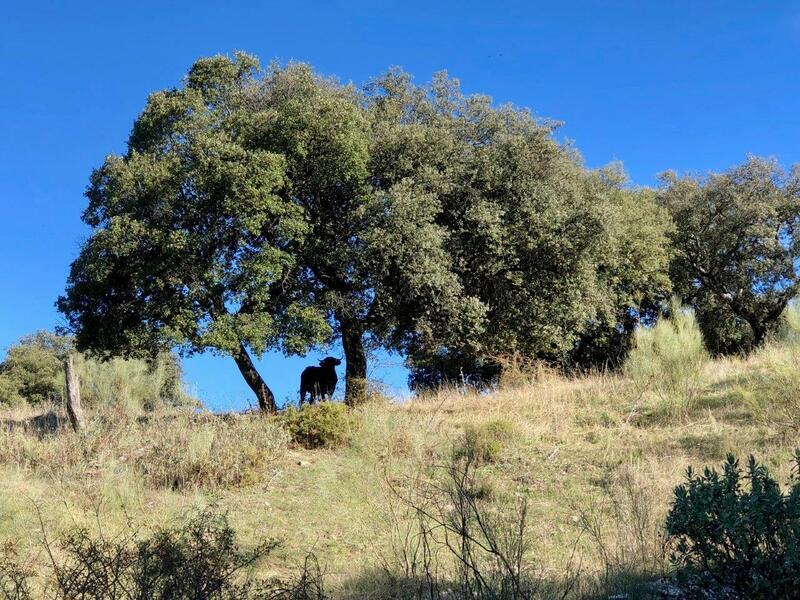 For example, hiking up through the oak forest, guided by one of the farm’s permaculture volunteers, passing the horned pajuna cattle to the top of the ridge was a truly memorable morning. 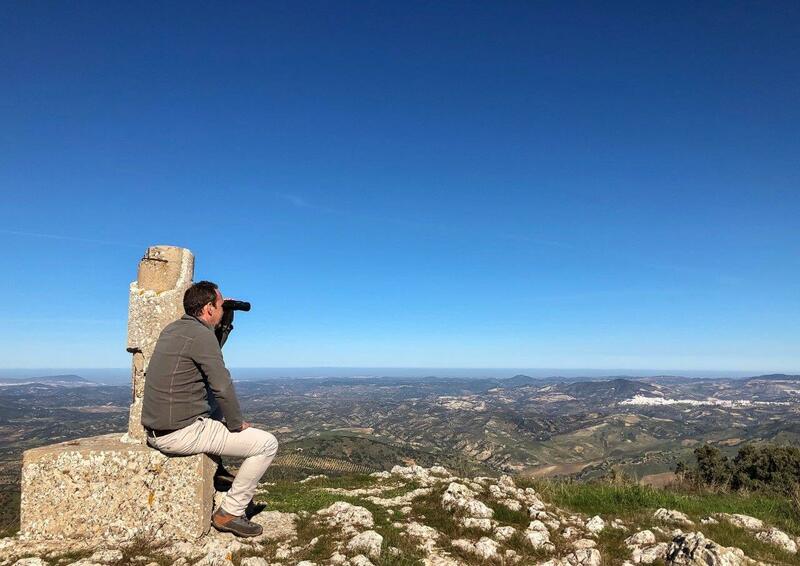 The climb was rewarded by 360 views from the peaks of Grazalema; the strikingly turquoise waters of the Zahara-el Gastor lake; to the distant white houses of Ronda glinting in the sunlight. 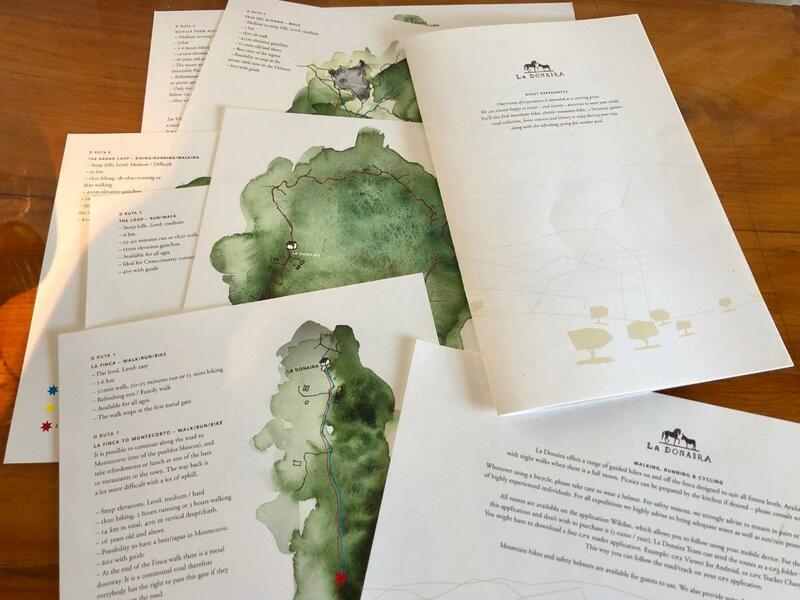 In each guest room there is a beautifully presented set of hiking trail maps, for self-guided, or guided walks through the countryside. La Donaira also has mountain bikes available for use. 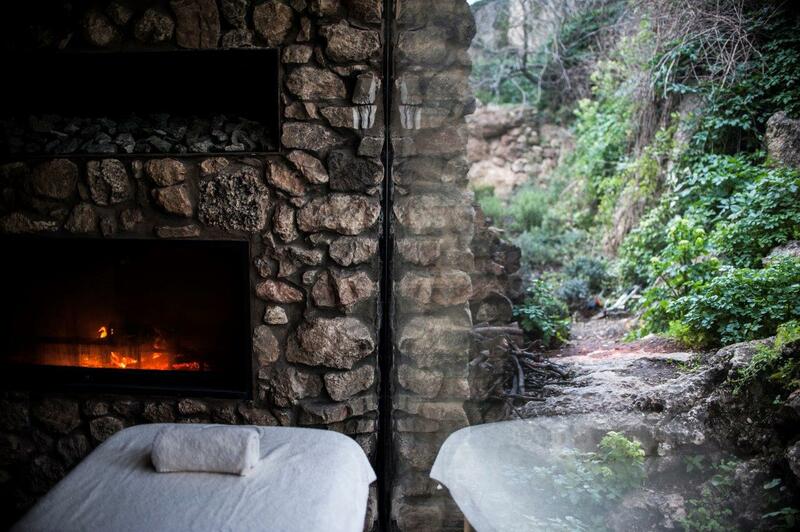 Wellness is very much part of the holistic La Donaira experience and that includes a good deal of pampering if you wish. 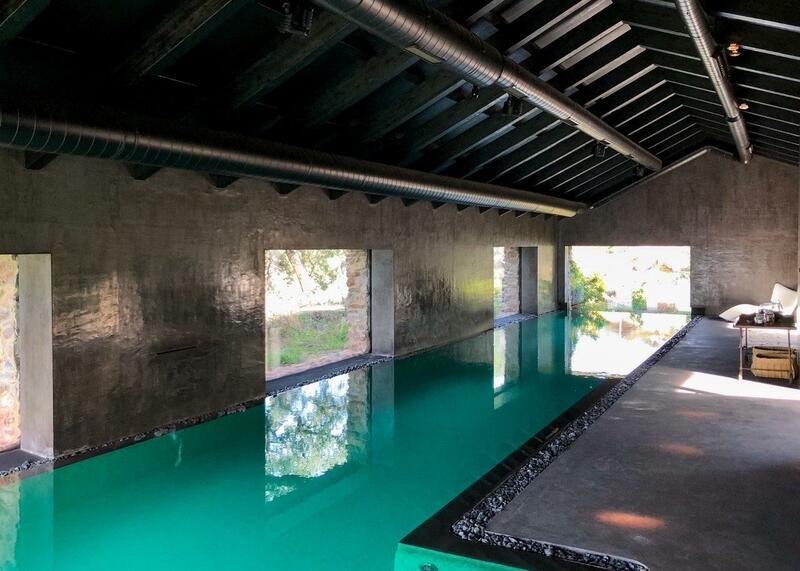 The indoor pool includes a sauna, and Turkish steam room. I was also tod that meditation, yoga, and massage are also part of the wellness offering, although I didn’t have time to enjoy these. I can vouch for the pool and steam room though! 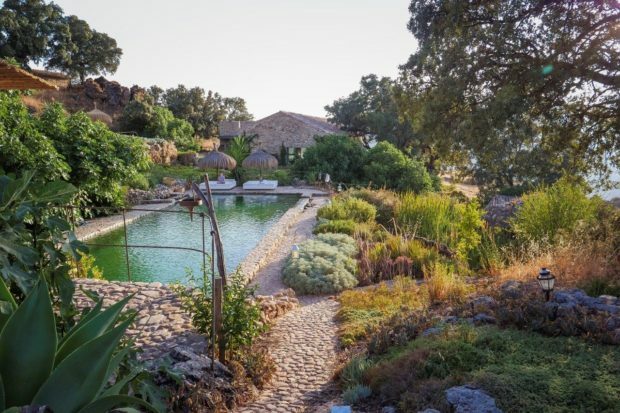 Outside, secluded on a garden terrace, sheltered by the rocky hillside is a large swimming pool, fed by mountain spring water. Sun loungers and daybeds are positioned amongst the aromatic Mediterranean flowers and herbs. The owners of La Donaira are clearly music lovers. 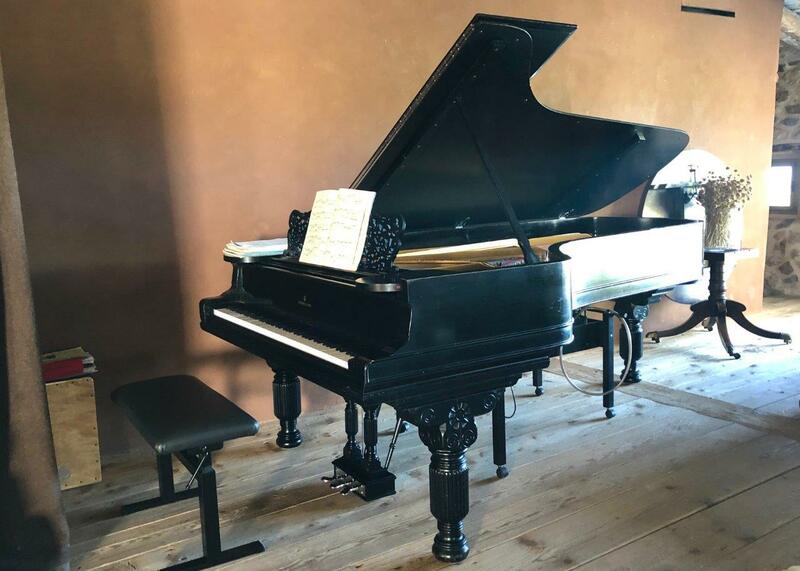 There is an elegant grand piano in the salon – said to be one of the oldest working (American-made) Steinways in the world. As a privileged guest you can tinkle the ivories if you wish. 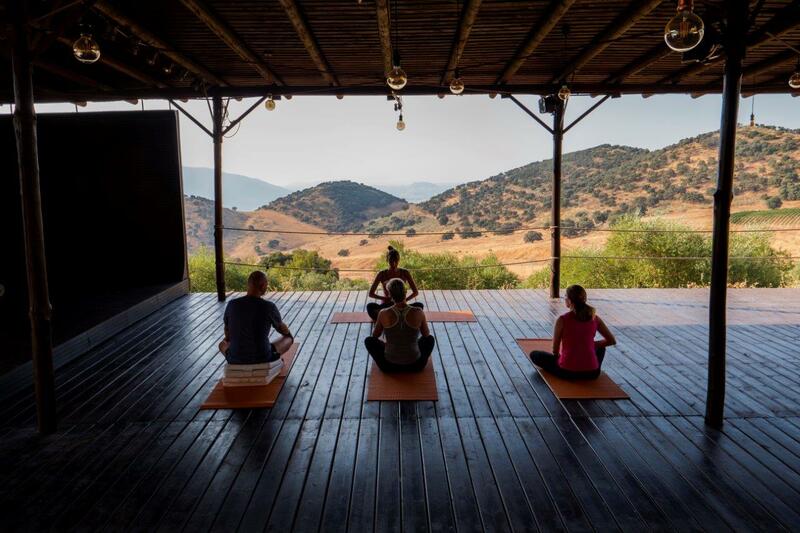 In addition, La Donaira hosts a series of music concerts, featuring world-renowned and emerging artists, performances out in the countryside, on the yoga platform overlooking the pool and gardens. For many it will be the estate’s equestrian centre that will be the major draw. 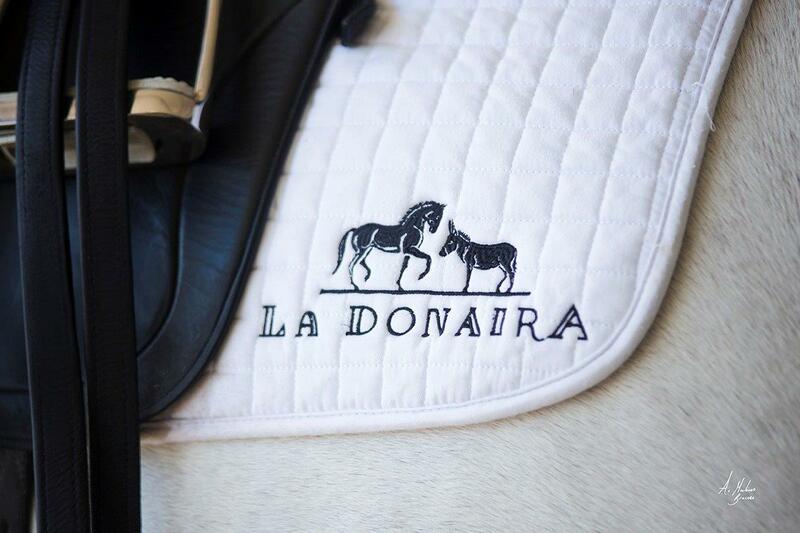 La Donaira has some 70 Lusitanos, bred, raised and trained according to natural horsemanship principles. I have to admit that I am allergic to horses, so I didn’t go riding! 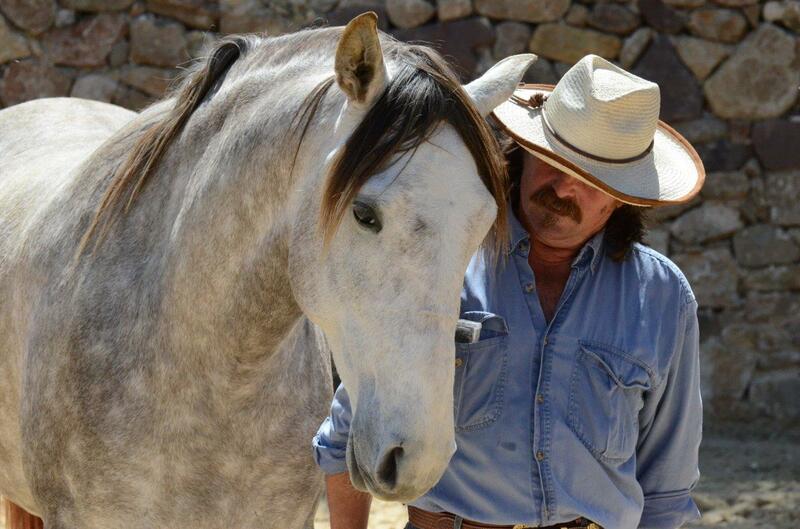 But I met Shamus, the estate’s natural horsemanship expert and he offered a compelling and powerful demonstration of his approach, with a young horse that was successfully mounted for just the second time. La Donaira has a multitude of horse trails, all affording wonderful views of the surrounding landscape. There are hacks for novice riders; lessons; and more challenging routes for experienced riders. So, there is my insight to La Donaira. This is the most remarkable place – I just can’t say enough about how special is the property. The holistic project embraces all aspects of wellbeing, making a stay here quite extraordinary. 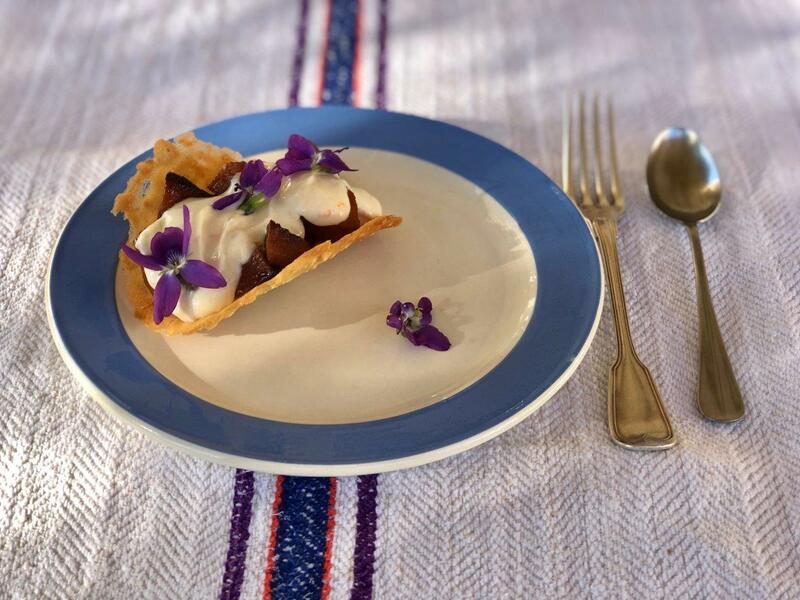 La Donaira’s immersive guest experience is for a minimum of two nights – with process from 340-440 euro per person, including all meals, snacks, and drinks.